Dzifa's theatre practice consists of three strands: plays that she writes for other people to perform in; ensemble performances in which she collaborates with and performs others on stage; and presentations in which she writes and performs solo. The following are a selection of such projects. The Spit of Me, Ongoing - The Spit of Me is Dzifa’s artistic, biological and social investigation into the body’s relationship with time, culture and identity via the wonder of DNA. Inspired by her grandma’s anecdotes of unconventional family members, Dzifa combines literature, performance, digital media and participation in The Spit of Me to dig beneath the superficiality of skin to uncover the hidden histories that connect us to each other and the rest of humanity through genetics, migration and memory. Brand Shorts, Purcell Room, Southbank Centre 2010 - As part of 2010's London Literature Festival, Dzifa took part in a symposium on exploring cross-genre possibilities. 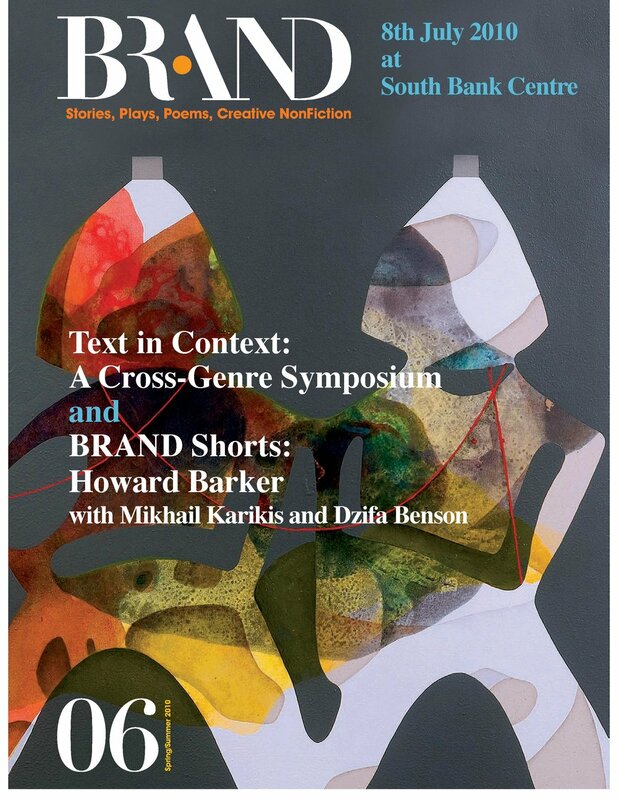 Sharing the bill with playwrigth, Howard Barker and artist Mikhail Karikis, Dzifa presented new work that explored how the body links the living, the dead and the unborn. Dzifa collaborated with sound artist, Gary Steward of Dubmorphology and visual artist and photographer, Rob Rainbow. Verbalized, UK and South Africa 2010 - Supported by Sustained Theatre, the British Council & South African State Theatre, the Verbalized tour was a unique collaboration between five poets from the UK and five poets from South Africa. It was part of a long term cultural exchange linking artists & arts companies in Britain & South Africa. Touring cities in the north of England and in Pretoria, Johannesburg and Cape Town, the project explored new ways of creating, devising & discussing poetry as a theatrical presentation. 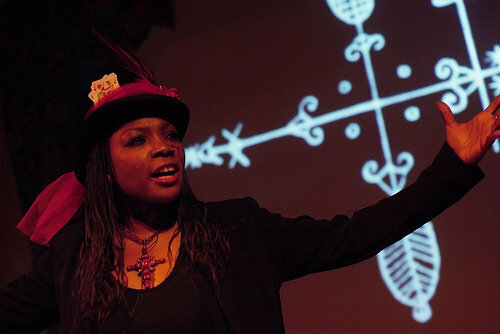 Translations, BBC Africa Beyond, Africa Centre, 2008 - Dzifa's performance focused on the persona and aspects of the Vodun trickster god Legba tracing a journey of how African mythology left the shores of Africa to find new expressions in the New World. Music and sound direction was provided by Zak Akhimien with film and visual projection by Craig Dow. A Festival of New Voices, Bush Theatre, 2008 - An extract of Dzifa's first play was presented when Westwords and The Bush Theatre joined forces to present a week-long festival of the best new writing, selected from the Westwords/8 Boroughs Creative Writing initiative. Embracing work from the widest possible cultural perspectives, emerging writers worked with professional directors to develop their scripts from the page to the stage, and mentored by Bush Theatre writers. 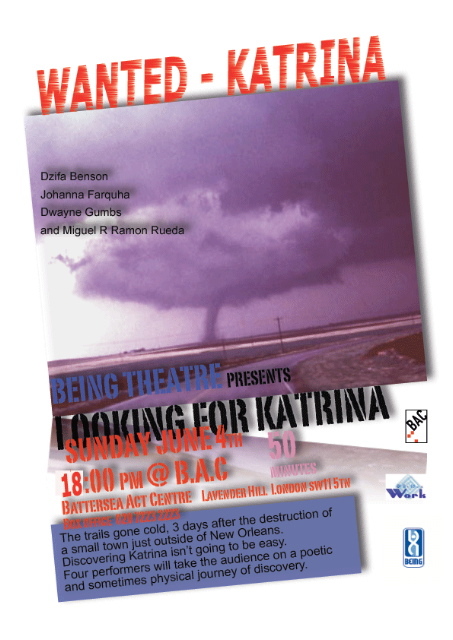 Looking for Katrina, Battersea Arts Centre 2005 - In her first piece of live art, Dzifa collaborated with two other performers in this live art project inspired by the effects of Hurricane Katrina on New Orleans and its environs.